Anthracite coal, mined from the planet's oldest geological formations, has spent the longest time underground. The coal has been subjected to the most pressure and heat, making it the most compressed and hardest coal available. Hard coal contains greater potential to produce heat energy than softer, geologically "newer" coal. Anthracite also is the most brittle among coal types. When burned, it produces a very hot, blue flame. A shiny black rock, anthracite is used primarily for heating residential and commercial buildings in the northeastern region of Pennsylvania, where much of it is mined. The Pennsylvania Anthracite Heritage Museum in Scranton underscores the coal's significant economic impact on the region. Anthracite is considered the cleanest burning coal available. It produces more heat and less smoke than other coals and is widely used in hand-fired furnaces. Some residential home heating stove systems still use anthracite, which burns longer than wood. Anthracite has been nicknamed "hard coal," especially by locomotive engineers who used it for fueling trains. Anthracite contains a high amount of fixed carbon—80 to 95 percent—and very low sulfur and nitrogen—less than 1 percent each. Volatile matter is low at approximately 5 percent, with 10 to 20 percent ash possible. Moisture content is roughly 5 to 15 percent. The coal is slow-burning and difficult to ignite because of its high density, so few pulverized, coal-fired plants burn it. Availability: Scarce. 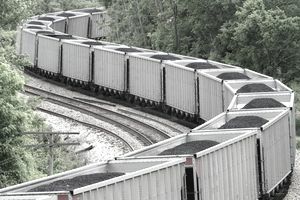 A tiny percent of all remaining coal resources are anthracite. Pennsylvania anthracite was mined heavily during the late 1800s and early 1900s, and remaining supplies became harder to access because of their deep location. The largest quantity of anthracite ever produced in Pennsylvania was in 1917. Location: Historically, anthracite was mined in a 480-square-mile area in the northeastern region of Pennsylvania, primarily in Lackawanna, Luzerne, and Schuylkill counties. Smaller resources are found in Rhode Island and Virginia. Anthracite is considered “nonclinkering” and free-burning because when it is ignited it does not "coke" or expand and fuse together. It is most often burned in underfeed stoker boilers or single-retort side-dump stoker boilers with stationary grates. Dry-bottom furnaces are used because of anthracite's high ash fusion temperature. Lower boiler loads tend to keep heat lower, which in turn reduces nitrogen oxide emissions. Particulate matter, or fine soot, from burning anthracite, can be reduced with proper furnace configurations and appropriate boiler load, underfire air practices, and fly ash reinjection. Fabric filters, electrostatic precipitators (ESP), and scrubbers can be used to reduce particulate matter pollution from anthracite-fired boilers. Anthracite that is pulverized before burning creates more particulate matter. Inferior coal rejected from anthracite mines is called culm. This has less than half the heat value of mined anthracite and higher ash and moisture content. It is used most often in fluidized bed combustion (FBC) boilers. Ranking: Anthracite ranks first in heat and carbon content compared with other types of coal, according to ASTM D388 - 05 Standard Classification of Coals by Rank. What Kind of Coal Makes Electricity?